You might be a successful entrepreneur, a CEO of the reputed company, an HR Manager of a renowned organization, or even the founder of a big brand, but are you an employer of choice? If you are an employer of choice then you must be a personality with whom employees would want and love to work. Being an employer of choice implies that the company offers a well-structured framework and an environment, where people are willing to work. The work environment must be so impressive to the people that they are interested to work on a long-term basis. Management needs to create a workplace, which is above their competition and that can offer employees with things beyond their expectations, such as – benefits, perks, purpose for being, training, opportunities, and compensation. As per the experts, any employer of non-profit or private sector, any size that is able to attract and retain, optimizes the top talent for long-term basis just because of the fact that employees want to be there. 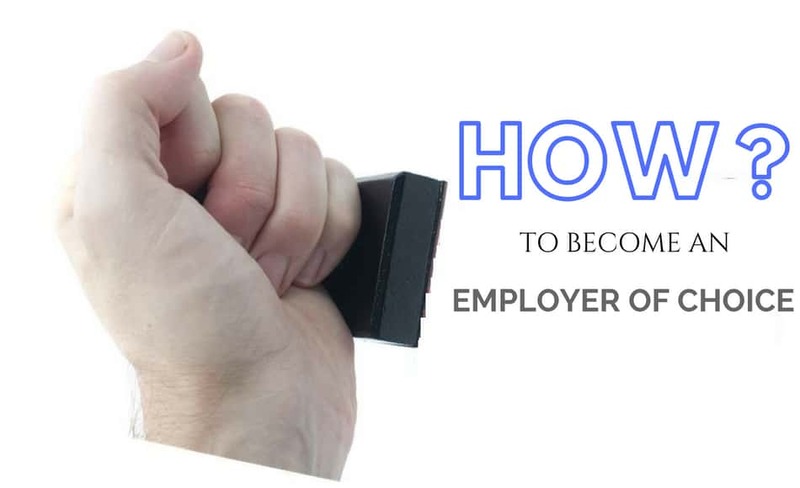 Why Becoming an Employer of Choice is Beneficial? An employer is one who creates a work culture and the workplace environment that impresses as well as retains superior employees. The organization with an employer of choice favors the well-being of customers and employees. Besides this, an employer of choice is able to focus more on business growth and strategy, and not just wasting energy on staff turnover and the other associated issues. very first initiative to bring an employer of choice is to clearly define the type of person you want to retain and recruit. It is an important initiative as hiring right employees can make a big different to the success of entire business. If you are able to recruit as well as retain employees who are best fit to your company, then you will be able to become a successful leader with a successful job. It is essential to offer employees with appropriate perks and benefits so that the best employees are attracted. Offering such benefits is also imperative to retain employees. If you think that your company’s brand is enough to attract employees, then you will be in a big misconception. Even if you are a small company but you have appropriate employees that are best fit to your company, then you can even compete with larger companies. If you want to attract and recruit the best candidates, then you must be aware about your competition. Your present employees as well as new candidates are always looking around to see the way other companies treat their employees. If you want to compete with others and stand as winners then you must offer unique benefits and perks and lots of other things that your competition is not offering. If you are offering your employees interesting and challenging work then this will keep your employees engaged. Even challenging work is always helpful in taking out the best potentials of the employees. This makes employees more efficient and responsible, which is great for their career as well as for the growth of the company. Also, if you desire employees to work for long time duration for your company then it is essential that you must offer them with a career path. This involves offering regular evaluations, mentoring opportunities, defined path to progress, and training for novel skills. The last but not the least initiative for employer of choice is recognizing employees to company morale and culture. Recognition can be identified in numerous ways. Fair play is essential but equally vital are accomplishments and the healthy time spent with the organization. Benefits, perks, bonuses, and free food can be offered to employees on team as well as individual basis in order to offer employees with recognition. An employer of choice offers employees with compensation and benefits that are equal to or above what their competitor is giving. Employers can deem themselves as employer of choice only if they possess all the below mentioned characteristics. Employees love to work with employers who are financially stable. Employees don’t want to experience the fear of losing the job as productive and sound employees are always focused on company’s goals and functions, rather than on financial worries. Another characteristic of an employer of choice is to offer employees with the authority to take responsibility and decisions related to the way they want to do their job. Employees must be provided with a strategic outline of their job, including the company’s goals, mission, vision, values, and other important facts. But the power to select a suitable measure or to perform in a certain way must be held with the employees. The company must be focused on ensuring that their employees do not practice any illegal operations and are able to meet their goals. The employer of choice must encourage employees and offer them timely opportunities to grow. This relates to offering them opportunities to expand their skills and boost their career. Some of the opportunities can be performance development, career paths, career planning, external and internal training options, job assignments, and more. This way, employees will be able to enhance their skills. It is not necessary that an employer is always right and employees are always wrong. The employees must not set any choices and directions for the company, but they expect respect from their coworkers, bosses, and other individuals involved in the job. Employers by choice are always dedicated towards their employees as well as their customers. They must strategize policies and strategies that can boost employee retention, perks, and engagement strategies. The employer of choice plans lunch with their customers, including their employees at regular intervals. This makes the employees feel involved and avail a sense of commitment from the employer. Employer of choice must always share important information and data with employees ranging from the financial progress of the company to tracking their success. Employees must feel like members in the crowd and must be aware of what all is happening in their organization. Employees must feel like friends at work. On a broader scale, the employer of choice must be cultural fit to the recruitment, colleagues, and enjoy working with the team. An employer of choice must always attempt to create a positive atmosphere in the workplace as this will help maintaining a healthy work environment and also increases employee retention. If an employee possesses rich interest in the work, then he will be able to perform better. Hence, the employer of choice must find ways to create a link between employee’s performance and interests. This can be achieved through appropriate strategies and systems offering regular feedback and guidance. The employees are willing and sometimes forced to be more productive. As a result, they are demanding initiatives like flexible scheduling, work from home, timely leaves, and more in order to maintain proper work-life balance. If employees will feel distracted from their families or socializing events then they will never be able to perform productively at the workplace. It is because such occasions reduce the employee stress and support them to achieve their professional as well as personal goals. Employers by choice must offer timely feedback to employees about their growth prospects, achievements, performance, and fields that need improvement on a regular basis. Offering employees with feedback is one of the powerful forms of employee recognition. The recognition must be regular, reinforce positivity, target real success, and must be as per the desired behavior. If an employer of choice is favoring someone or is known with a perception of unfair decision making, then he will not be able to retain the most productive employees. It is vital for employers to make fair decisions and apply policies that treat all employees equally with same consideration and regard. This will also make the workplace more friendlier and healthier place to work. According to the study from Mckinsey Consulting, the potential to attract and retain the finest talents will offer a business with incomparable competitive advantage. Hence, if you want your business to avail unmatched success and unbeatable growth then you must become an employer of choice. To become a successful employer of choice, you need to follow an integrated approach for hiring employees. Engage with your training and recruitment team in advance to inform them about the people you want and the exact requirement you are looking in the new candidate. Make sure you identify what you want and what you don’t and only then make the recruitment. Inculcate flexible working schedules in your work culture in order to retain staff for long term. It is not important that you outline a work schedule that is exactly as per the expectations of the employees, but at least suitable to the hectic lifestyle to a great extent. It is important to induct new recruits not just in technical skills but also in their organizational culture. It is essential to expose individuals to call handling. This is an imperative strategy to offer new employees with an idea of what life would be, working in that specific business. Beyond this, the organization must also introduce a procedure where the team managers are made to communicate with the new recruits during the process of induction. If you offer employees with numerous flexible benefits, then this can enhance the long lasting appeal of the business. Offer employees with not just one but numerous reasons to stick to your company and to not switch to your competitive organization. Offer employees with facilities that they won’t be able to find elsewhere. If you keep your employees involved with the work and the job then this seems interesting and appealing. You can keep your staff involved by offering them freedom to communicate with the peers about their problems, freedom to have flexibility at work when required and continuous offer opportunities for advancement and growth. Happy employees are able to work more productively and with more interest. This is great for the success of the organization. Hence, if you dream of a successful business then you must try to become an employer by choice. Previous articleHow to Avoid Neck and Shoulder Pain at Work? Managing Well – How To Be Approachable at Work?